Dahi wala gosht means meat cooked with yogurt and dhabe wala mutton means the mutton curry one gets in highway eateries. This is yet another rustic mutton curry that doesn't involve many steps in the cooking procedure. The highway eateries cook large amounts of meats with balanced spicing but the cooking procedure is not complicated. Almost all of them cook the marinated meat in just one step, but they do slow cook all meat as a rule. 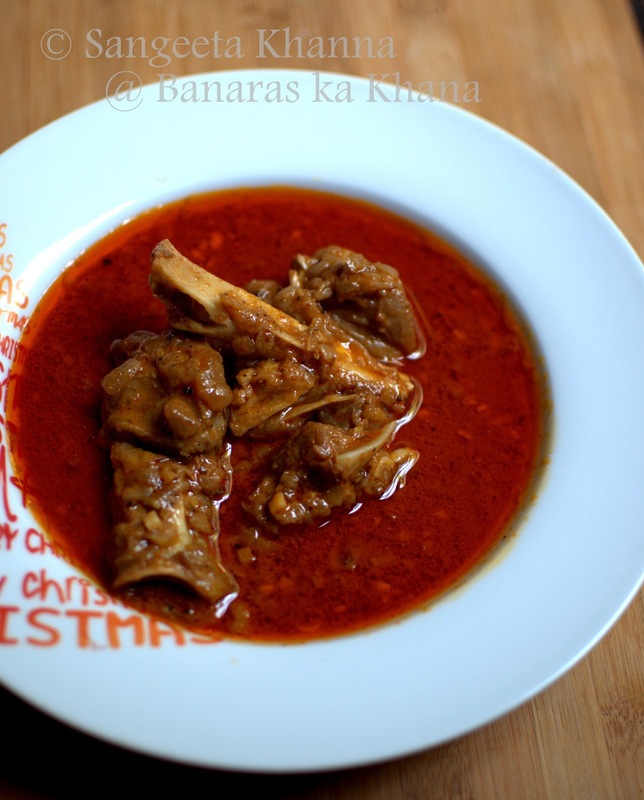 At least an hour's marination time and about 2-3 hours cooking time makes sure the cooked meat curry is truly melt in your mouth type with a rich gelatinous sauce clinging to the meat. Some of them cook the meats overnight but you can always cook small quantity at home for approximately 2 hours with great results. You normally get kulchas with such mutton curries in dhabas, at home you can choose what kind of bread you need with it. Such meals do not require any side dishes, just some raw onion on the side as they serve in the dhabas will be perfect. You would be glad to know that this recipe is just 2 steps, just mix all ingredients first and rest the mixture (the marinated mutton) for a couple of hours. Then heat ghee and cook the mutton on very low flame tossing and turning once in a while in between. 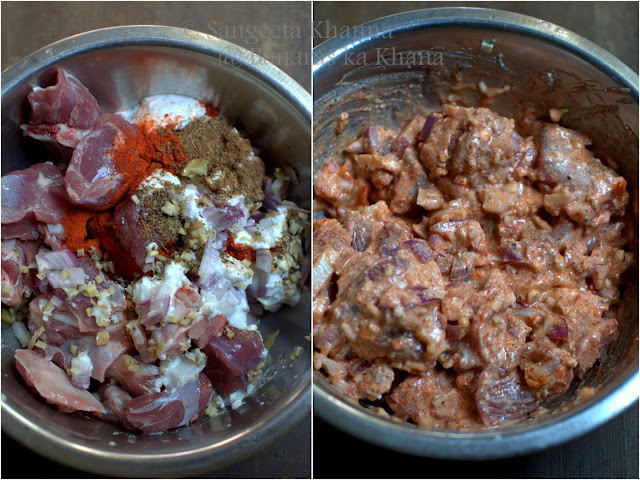 Mix the mutton pieces with all the ingredients of the first list. Marinate for 2 hours or overnight. At the time of cooking heat the ghee in a wide heavy bottom kadhai, and tip in the whole spices. Wait till they sizzle and then slide in the marinated mutton slowly. Bhuno the mixture on low flame slowly, turning the meat once in about every couple of minutes in the beginning for 20 minutes and then cover the kadhai with a lid and let it simmer. Check after every 15 minutes and keep adding 1/4 cup of water every time you feel it is getting dry. Be aware after an hour's time of cooking the meat as it might stick to the bottom if your kadhai/pan is not thick enough and the flame is not calibrated to cook very slowly according to the thickness of the pan. Just keep simmering the mixture and watch when the meat is about to fall off the bone. The gravy starts looking almost gelatinous after 1.45 to 2 hours of cooking and it can be ready any minute after that. Adjust seasoning and consistency of the gravy by adding a little water if you wish. You might want to throw in a few slit green chilies at this time. They taste great but coriander greens should be avoided as this meat tastes better without dhaniya patta. 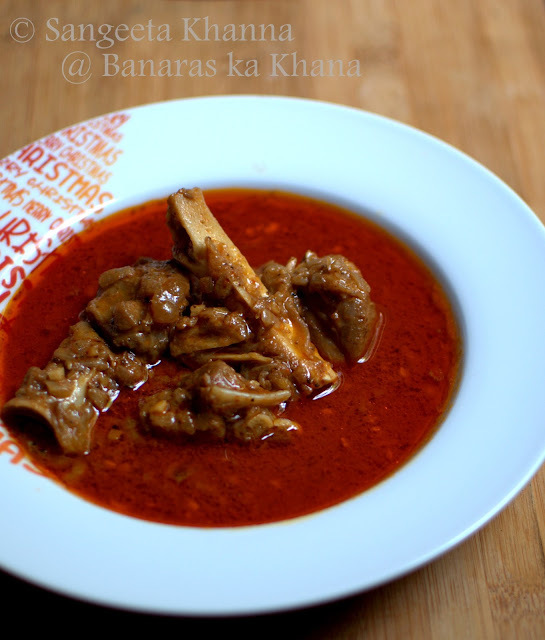 This dhaba style meat will be one of the most delicious mutton recipes you have tried. You can always cook it in slow cooker if you use one. I normally like to keep stirring or feeling my curries when I cook, so the long cooking time is not a problem if I am home and want a therapeutic cooking time. After all the treat of slow cooking is immensely yummy meat. The flavors are not too overpowering spicy, the yogurt makes the curry a little towards tart but the chilly heat and the spices complement the yogurt and slow cooked gelatin extraction kind of gravy really well. Everything that was chopped finely or not so finely gets soft and silky after slow cooking. Sponge off the gravy with some freshly baked whole wheat naan or roomali roti. You would love to cook this for crowds too. It is one of those crowd-pleasers and does not need much equipment to be cooked. I see that there is new favourite serving bowl Sangeetha! Please feel free to use mustard oil. It will be as good even though the aroma may differ slightly.